A Unique Father's Day Party- Learn how to throw a cool Sports Themed Party! Father's Day, coming up on June 16th is not far away. The day meant for celebrating the pivotal role played by dads in the upbringing of their children should not be ignored or taken lightly. Dads are often taken for granted as we shower all our love and affection on our dear moms and it for this very reason, they deserve a special day of their own. So, go on, make your dad feel appreciated and loved, this Father's Day. Throw him a super-awesome party! As most fathers love some sport or the other, how about planning a sports themed party for him? Covering all the popular sports such as football, baseball and basketball, we promise you that your dad will love this all American sports party! 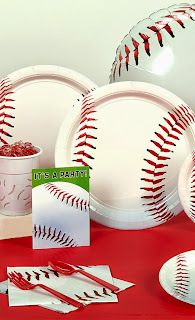 In addition to the Sports Themed costumes for dad; invitation cards, tableware and gifts are some other things needed to make sure that your party is a success. Let's take a look at the costumes first. To make sure that dad gets into the spirit of things, get a costume for him and make sure that he wears it! 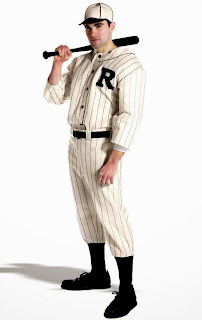 Choose from a baseball player costume or a footballer costume. If he has a thing for the rules, dress him up as the referee, which would surely put a grin on the faces of all his children! 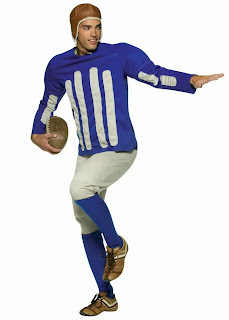 If your dad is the kind of person who goes crazy if he misses even one of the NFL matches, then this Footballer Costume is perfect for him. This costume includes the Helmet, jersey, knickers, and socks. Father not a fan of god ol' American Football? No worry, we have this Baseball Player Costume..Dad likes baseball at least, right? This costume includes only the uniform. It does not include socks, shoes or bat. So, every time he is watching a match, your father screams at the referee, complaining about how he can't judge worth a damn. 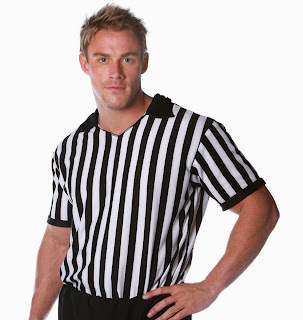 If that is the case, then this Referee Costume would be perfect for him! This costume includes the shirt and also includes a whistle. It is also available in Plus Size. Invitation Cards and Thank You cards are necessary if you're inviting a lot of friends and relatives for your party. 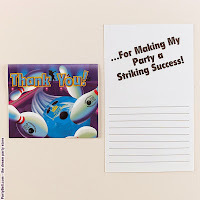 Such cards help in letting your guests know just how much their attendance is appreciated. 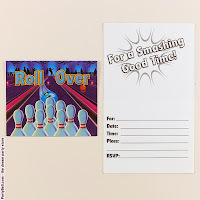 Check out these cool Bowling Invitations and Thank You Cards. Bowling is one of the few sports, which has virtually no detractors! So, it is a pretty safe option to go for. Who can possibly hate bowling, right? These cards come in packs of 8. Centerpieces add a touch of elegance to the occasion and a Father's Day party is no exception! Considering we're going for a sports themed party, then it only makes sense that the decorations such as centerpieces are also appropriately sports themed. 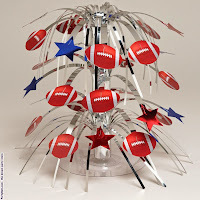 Check out these cool football themed centerpieces. 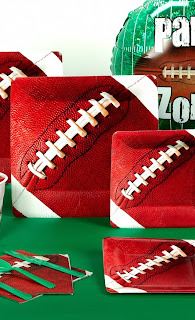 You can go for a pretty foil spray centerpiece, which boasts of gleaming football cutout pieces. Or, go for a more comical Cascading Football Centerpiece. It really depends upon the look you want to go for. Save yourself the hassle of going for individual pieces of cutlery, plates or napkins, just go for our amazing party packs. These packs contain everything, from decorations to cutlery, everything you need to make your party a happening one. Check out our Sports Inspired Party Packs! You can go for either a Baseball or Football Themed Party Pack. Just a thought, the football one will match well with your football themed centerpieces. Daddy Dear will be expecting a gift, once his party wraps up..Soo, better be ready with an amazing gift, when that happens! A perfectly unique gift for Father's Day can be this cool fedora. 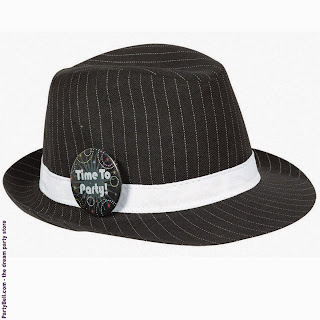 Featuring a smart black design and a cute button that says, 'Time to Party', your dad will absolutely love this Fedora Hat. Fedoras are perfect for parties and can be a wonderful addition to any man's wardrobe. 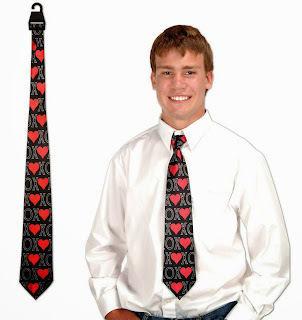 Another great gift for Father's Day can be this comical tie featuring hearts, X's and O's. This necktie will definitely crack your dad up! With all this useful advice and ideas at your disposal (just kidding! ), better get started on planning that Father's Day Party. We can assure you he will be most surprised and pleased by the sports theme of the party. Good Luck!